JCI is moving towards "build to order" services with the release of their first LTE SIM card. The B-Mobile4G Chameleon SIM card uses Docomo's Xi network. It initially costs ¥5,800 for 21 days or 3000 MB, and micro and regular sizes are available. Along with an LTE mobile router, this will be available from 3/31. Chameleon indicates that the SIM can be recharged as one of three different products each month - the build to order aspect. Depending on your needs, each subsequent charge can be for a different product. If you move outside of the still relatively limited LTE area, simply chose a different recharge option. *These are theoretical speeds. Outside of specific indoor locations, the maximum Xi LTE downlink is 37.5 Mbps. This is the LTE version of the Fair SIM. B-mobile is not just innovative with their service offerings, but with their product names as well. Will I get LTE speeds using this on the new iPad? Based on what's been announced by Apple (that I've seen), most likely not. Hello, I'm not too sure if this is the post I should be attaching this comment to, but a member on XDA suggested I ask you directly. 1) My international Samsung Galaxy S II (i9100) is not 4G/LTE-compatible, so if I get this card, will it just max out at the highest speed that my phone is able to handle? Or will it just not be able to ride on the data network at all & I'll essentially have a SIM card that I can't use? 2) Related to the above question, I tried comparing Wiki/GSM Arena's frequency/network information and the page you've linked up there, as well as Googling around but I couldn't find any conclusive answer - do you know if the international SGSII is compatible with b-mobile's data network? I'll be going to Japan for a month in June so I was considering getting this or the u300 since this seems to offer faster speeds with a higher cap than b-mobile's FAIR. 1) yes, the speed will be limited by your phone. Your phone will get 3G speeds. It won't get LTE speeds, obviously, but it will fall back to 3G and the SIM should work. 2) yes, it should be compatible. Where are you using it now? If it supports UMTS-2100, it will work. Get the 1GB Flat Rate SIM. That will be the best deal for one month and provide the fastest downloads at the best value. 2) I'm using it in Singapore, and according to Wiki, my telco uses UTMS-2100 so I guess it will work! Are you referring to the b-mobile Fair, for the 1GB Flat Rate SIM? According to your post (with all the b-mobile cards), it's priced at ¥8,350/1000 MB (min. ¥2,087/month), which is a little confusing but I take it to mean ¥8,350/1000 MB if I use all 1GB in the month that I'll be in Japan? Would this current 4G card not be cheaper then, if it offers "¥5,800 for 21 days or 3000 MB"? No, referring to the 1 GB Flat Rate SIM, ¥3,500 for 1 month or 1000 MB at basically full speed. O: !! Is Costco in Japan like Costco in America? When I was in the US, entering the Costco warehouse required some kind of membership card. ¥2,980 sounds like a steal..
Yeah it is pretty much exactly the same as in the US. The same membership card will work in the US and Japan. They also carry most of the same food as the US ones do which is nice. Hm I guess I won't be able to get the 1GB Flat Rate SIM at ¥2,980 then; I don't have a Costco card as there's no Costco available in my country. Thanks for sharing, though. Is this offer suitable for travellers? Last year I didn't get any SIM card for my stay in Japan, this time I'm debating whether to get a prepaid data plan for my New iPad (and/or one with phone option for my phone) or subscribe to one of the hotspot WiFi services that one can find anywhere for the iPad and just go with a prepaid card for the phone to make calls. What would you suggest? The Chameleon offer looks good to me. I bought the Chameleon SIM thinking I'll have fast 3g speeds but now I honestly CANNOT recommend this to anyone. There is a clause in the TOS that states that bandwidth will be throttled if usage exceeds 360MB within a period of 3 days. And from my experience, that "throttled" speed is around 64kbps. So that means that for the initial 3000MB charge, only 2520MB/3000MB can be utilized at "carrier speeds" and the rest must be used at 60kbps. And for the 5000MB charge, only 3600MB can be used at full speeds. And that's only if you use it so that you perfectly hit 360MB every 3 days. The chameleon SIM clearly does not give what you payed for and therefore I seriously cannot recommend this SIM to anyone. Similar question again. Would I get 4G in an iPhone 5? (European GSM model - 2100/1800/850 supported). the iPhone 5 isn't working with Docomo's LTE, and the reasons won't be exactly clear until it gets jaibroken. An iPhone 5 will still work with FOMA, but you'll get normal 3G speeds. So bmobile will work but not be as fast. 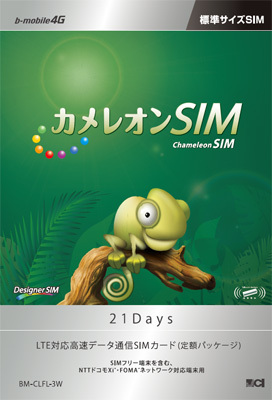 My brother bought b-mobile 4g Chameleon SIM (21 days) from Japan. Is MY HTC desire COMPATIBLE with this sim(4g)? This is my phone specifications.